Our Pipe & Drape Kit collection covers all the beautiful variety of photography backdrop stands, stands with high quality bases and wedding photo exhibition booth. These party essentials are made from high quality material and are available in various sizes that can be perfectly reused for your all upcoming events. From duchess sequin backdrops to wedding photography backdrops, these pie and drape kit can be used for any kind of indoor/outdoor event organized by you. These bulk priced party essentials are perfect for photo shoots and wedding aisle decorations. 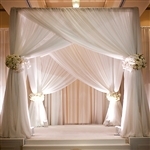 They can be beautifully decorated by using ravishing flower settings, LED’s, Shimmery fabrics and decorative net. Why buy Pipe & Drape Kit from RazaTrade?